While the concept may not have panned out in the long run, Freestyle Superstars was a good idea in its time. It was a step towards separating elite players from role players, as well as implementing advanced controls and signature moves. It wasn’t as deep as later methods of giving players their individual traits and skills, and the moves were also prone to being a little cheesy, but the concept had merit. 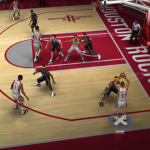 NBA Live 07 expanded upon Freestyle Superstars with two tiers of abilities – Superstar and Star – as well as the ability to equip multiple FSS movesets and switch between them on the fly. The prior gen version of the game also added a third mechanic: X-Factor players. The term X-Factor is commonly defined as a special talent or quality, sometimes one that’s difficult to explain or quantify, or a variable that could have a significant impact on the outcome. It’s a term that’s often used by sports analysts, and in a team sport like basketball, usually refers to key role players whose performance will play a big role in their team’s overall success. That’s essentially what the X-Factor mechanic was trying to replicate in NBA Live 07, with X-Factor players being significant players, but a step below Superstar and Star level players in terms of their ratings and abilities. A key difference is that they didn’t posses any FSS moves; at least to begin with. Players who qualified as X-Factors had ratings that were not quite good enough to quality for a Star level Freestyle Superstars moveset, but were relatively close. By performing well they would temporarily unlock the Star level FSS moveset that their ratings were closest to qualifying for. This represented the idea of an X-Factor player getting into rhythm and turning in a strong performance, thus being the variable that tilted a game in his team’s favour. They couldn’t be relied upon as heavily as a player with Superstar or Star level moves, but with their ratings and temporary FSS moveset, they were capable of stepping up and being the spark that their team needed. In practice, getting an X-Factor player in rhythm and activating their Star level FSS moves required giving them minutes, and keeping them involved by putting up stats. Once X-Factor status had been activated, users could activate the moveset by holding down the Freestyle Superstars trigger, and pressing the Off-Ball Control button. 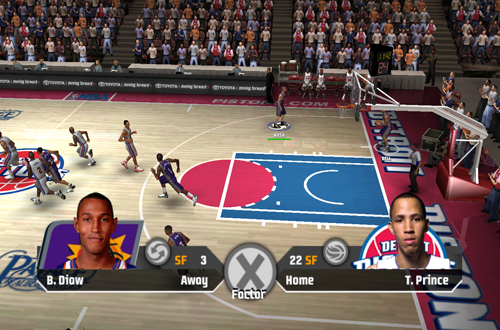 The X-Factor for both teams were displayed in an overlay after the first basket in the game was scored. If a team had more than one player capable of being an X-Factor, one of them would be randomly chosen as the X-Factor for the current game. The current X-Factors and their status (Locked or Unlocked) are also viewable in the Pause screen. Conceptually, it was a logical extension of the Freestyle Superstars controls, a further attempt to have key players stand out along with the elite stars. If an X-Factor player was young enough and had sufficient potential, they could develop into a Star level player, or even a Superstar in rare cases. This represented the idea of a young role player on the cusp of bigger things, emphasising the concept of differentiating players with defined roles and skill levels. Even the random selection of players when a team had more than one X-Factor was an effective method of representing situations where there were multiple role players who could feasibly step up on any given night. 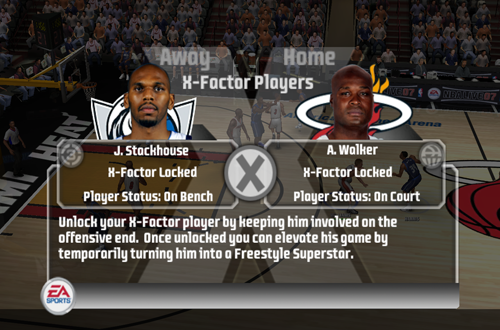 Interestingly, although the Xbox 360 version of NBA Live 07 also introduced multiple tiers of Freestyle Superstars abilities, it did not feature X-Factors. Instead, it utilised a mechanic called In the Zone, which was an ability that was exclusive to Level 3 Freestyle Superstars players. Like X-Factors, it was momentum based. Staying in control of the game while tallying buckets on successful Level 3 FSS moves, as well as racking up blocks, rebounds, steals, and assists, would allow players to perform even more advanced moves in addition to their Level 3 moveset. It was something different, but arguably it just made elite players more overpowered. Although a solid idea for the time, the concept of Freestyle Superstars and X-Factors didn’t pan out in the long run. Aside from some of the moves being too powerful, the ratings requirements made it somewhat restrictive. Lower rated role players who were notable as specialists when it came to defense, three-point shooting, and so on, either had to have their ratings fudged to qualify, or miss out on abilities they should have. It’s telling that EA Sports began to move away from Freestyle Superstars beginning with NBA Live 08, instead opting to expand player ratings and implement signature moves, as well as unique jumpshot animations and player-specific dunk packages. The concepts introduced by Freestyle Superstars and related mechanics such as the X-Factor players would also come to be better represented by Traits and Badges. On top of the expanded ratings and AI attributes governing performance and skill level, the Badges and Traits better represent players with standout abilities by boosting shooting percentages, making passes more accurate, or otherwise allowing players to be more proficient at some aspect of the game. These attributes can be applied to any player, and are always in effect. A lot of basic moves that were once exclusive to Freestyle Superstars players – like manual bank shots – are sensibly now part of deeper controls. Still, the idea had to start somewhere, and those early concepts paved the way for the better mechanics that we have in today’s games. Although they had their issues, credit must be given to Freestyle Superstars, X-Factor players, and other gameplay concepts that tried to make players stand out beyond their ratings, as well as expand upon the controls. Their influence can definitely be seen and felt in recent releases, and even though it was necessary to go back to the drawing board in terms of the execution, the idea was still a step in the right direction. In searching for the X-Factor to improved controls and tangible player differentiation, it was a commendable solution.